St. Paul’s only major art museum reopened in early December in a bigger, better, brand-new space in the 1890s-era Pioneer Endicott building. The Minnesota Museum of American Art—affectionately dubbed The M—had been at risk of closing permanently only a few years ago. Now it’s back and brimming over with art and visitors. 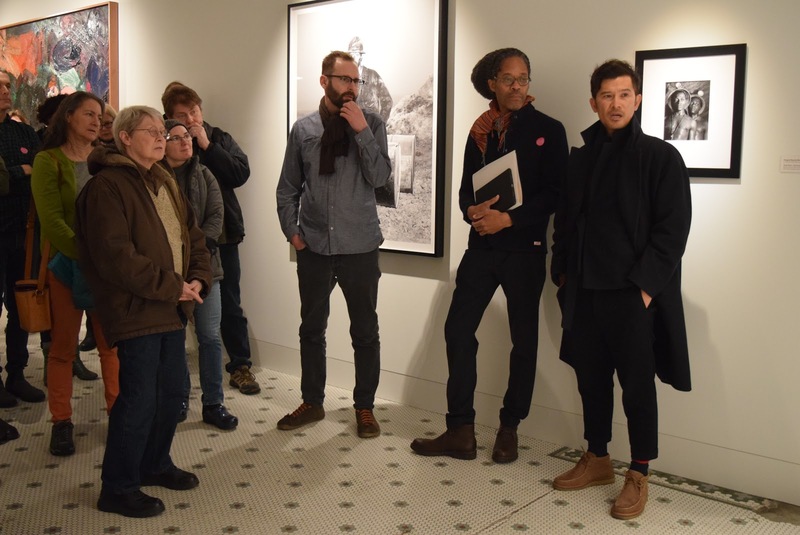 Guiding more than 40 art enthusiasts through the new location on Saturday, Dec. 15 was Metro State community faculty member G.E. Patterson. He is a poet, critic and teacher of creative writing. 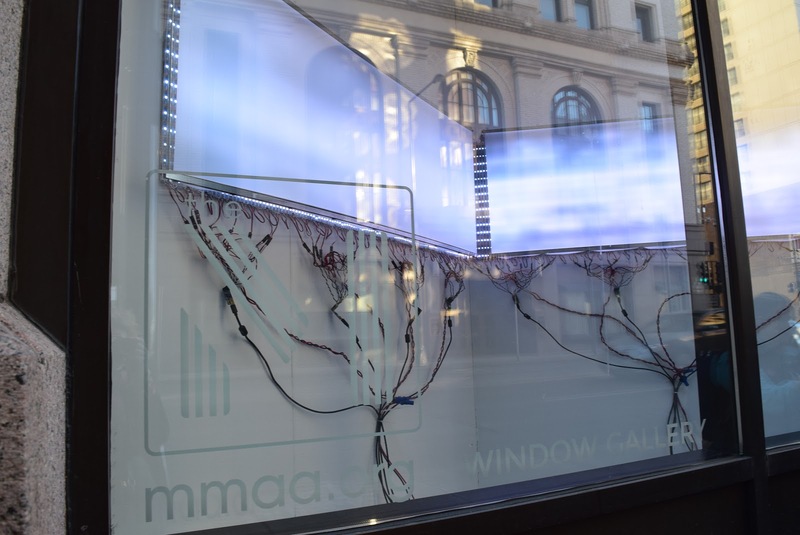 Bowen, a Duluth-based sculptor, brought the tour group to see Waveline, his conceptual, electronic sculpture displayed in The M’s Window Gallery. Waveline is visible to passersby on the streets of downtown St. Paul. It consists of live video feeds of two coastlines on opposite ends of the globe. The left two LED panels, which meet each other at a 90-degree angle, show a grainy, undulating image of where the Atlantic Ocean meets a shoreline in Puerto Rico. The right two panels, also positioned at a 90-degree angle, display nothing at all—just two blank screens with a tangle of rainbow-hued wires beneath them. Was that due to some technical glitch? The nothingness was no glitch, the artist explained. 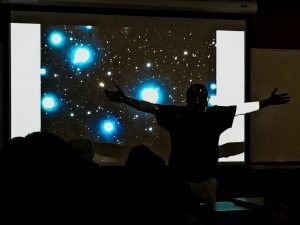 “[You’re looking at nothing right now because] it’s completely dark.” The right panels were showing a live feed of the Indian Ocean, from off the coast of Bali in Southeast Asia. 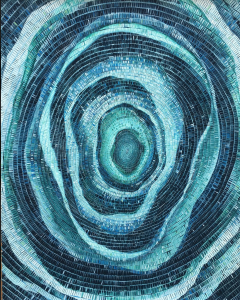 The piece includes over 7,000 LEDs, which together emit ultra-low-resolution images. It is less like HDTV; more like watching a moving Monet painting. Although Nguyen’s medium and subject matter are entirely different from Bowen’s, his landscape also seems to subtly glow. Visitors unfamiliar with the artist were surprised to learn that “Untitled I” is not a giant photograph. Instead, Nguyen used many layers of thin acrylic paint to create an incredibly realistic farmstead scene, recognizable to anyone familiar with rural Minnesota or South Dakota. The painting is two-thirds winter sky—not wholly gray or blue or white, but somehow all and none of these colors. The horizon is the dominant presence in Nguyen’s work, and as with Bowen’s indistinct video feeds, that effect is very intentional. Nguyen was born and raised in Vietnam and immigrated to the U.S. at age 16 with his family. They lived in California for a time, then made a cross-country drive to resettle in the Midwest. 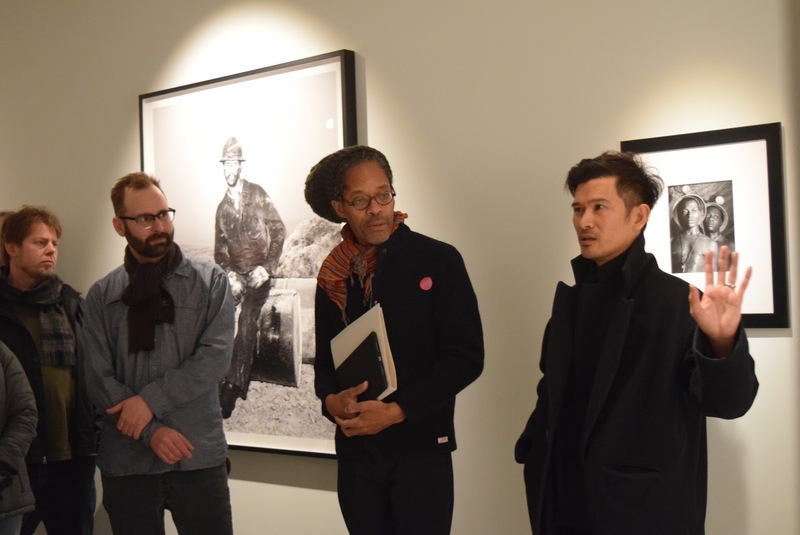 Patterson added his perspective on landscape and place during this conversation with Nguyen. Patterson then invited the attendees to share their thoughts on landscape. One audience member wondered about the thematic similarity of horizon in both Bowen’s and Nguyen’s work. “These emotions, combined with melancholy and anxieties around climate change, are all terrifically and interestingly balanced,” he said. 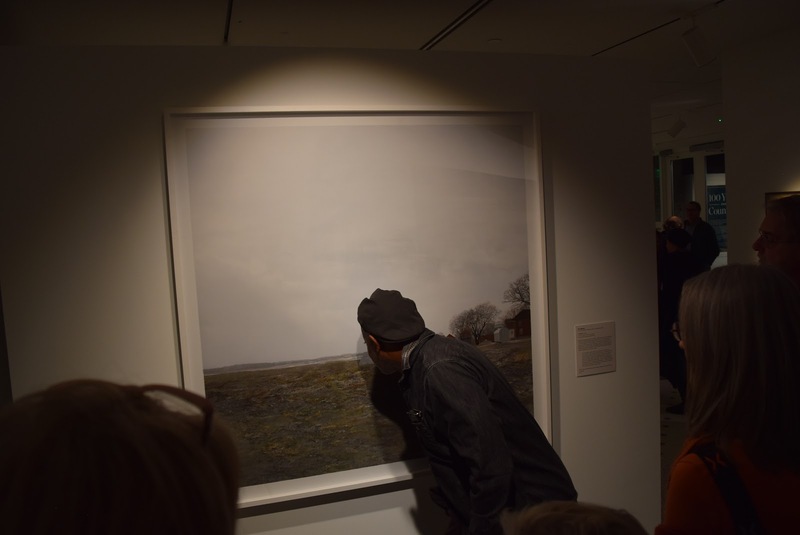 Gayle Cole, another audience member, told Nguyen that the dominant sky in his painting made her feel far away—but the care and fine detail he put into the farm buildings drew her nearer. Bowen, left, is a Duluth-based mixed media artist. He describes his sculptures as “kinetic, robotic, interactive and data driven.” G.E. Patterson, center, is a poet, critic and translator. He is slated to teach WRIT 251, Introduction to Creative Writing at Metro State in fall 2019. Minneapolis painter Teo Nguyen works in a photorealistic style. In addition to The M, his works can be found in the Minneapolis Institute of Arts and the Minnesota History Center. David Bowen’s installation “Wave Line” in The M’s Window Gallery on Robert Street in downtown St. Paul. The artwork was commissioned by the museum. Visitors cluster around The M's Window Gallery to view David Bowen’s "Waveline." 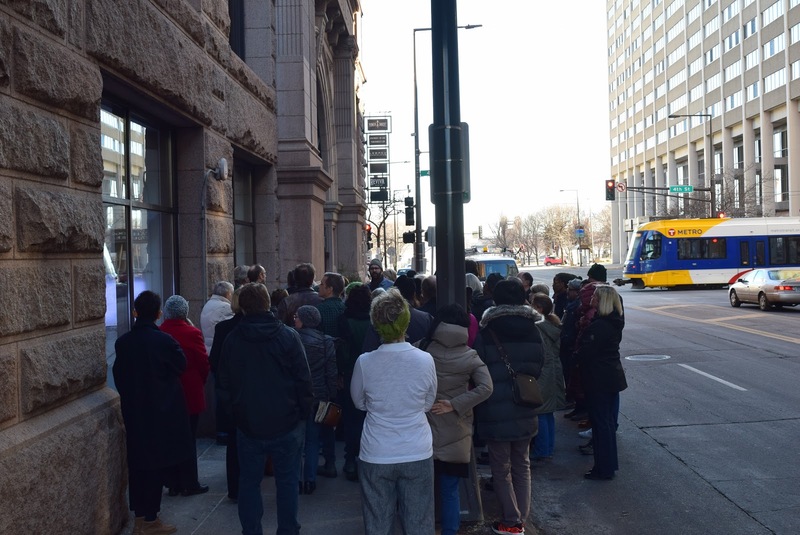 The museum’s new space in the Pioneer Endicott building in downtown St. Paul is located one block from Central Station of the Green Line light rail. 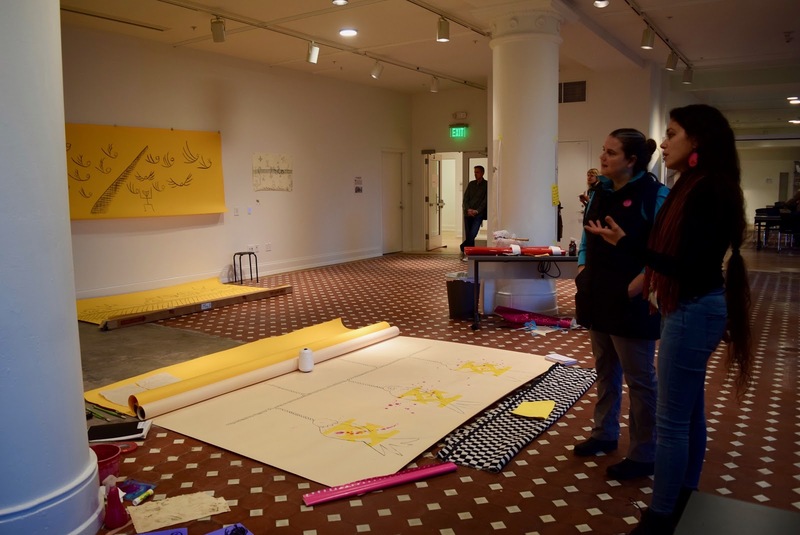 The Metropolitan’s reporter April Carlson, left, in conversation with artist-in-residence Rebekah Crisanta de Ybarra in The M's new Center for Creativity. The space will offer studio art classes, educational programs and intergenerational creative workshops. Want to see these artworks yourself? 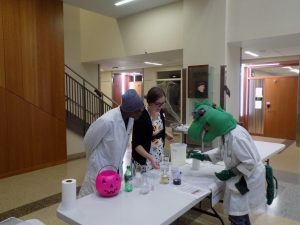 Wednesday – 11 a.m. – 5 p.m.
Thursday – 11 a.m. – 8 p.m.
Friday – 11 a.m. – 5 p.m.
Saturday – 11 a.m. – 5 p.m.
Sunday – 11 a.m. – 5 p.m.